Carmageddon is a classic racing game from the 90s that is as much about killing pedestrians and destroying your opponents than winning the race. A new iteration called Carmageddon: Reincarnation is currently in pre-Alpha on Steam and if it gets completed (fingers crossed!) it looks to be a great addition to the series. As of this writing if you pre-order Reincarnation you get a copy of Carmageddon 1 and 2. 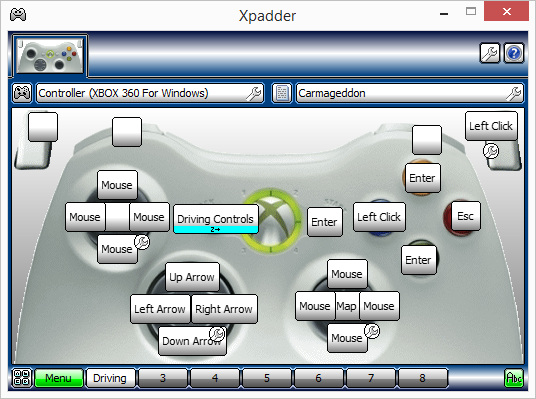 Carmageddon: Reincarnation includes controller support so I've configured these controls to be roughly the same. 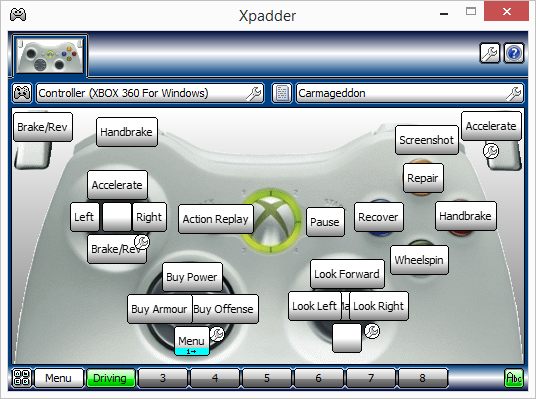 The profile opens in the Menu set - use the d-pad and sticks to navigate, A is Enter, B is Escape (back), X is left click. Once the race starts press the back/select button to enter the Driving set (see the screenshots below for more details). Unless you've changed the defaults in Steam the right bumper is mapped to take screenshots (F12)! Once the race is over press down on the d-pad to get back to the Menu set. I haven't tried this out with Carmageddon 2 yet but it might work. Other than that, if you have questions or problems with the profile let me know and I'll do my best to help out.